For over 30 years, Sartrex Power Control Systems has been an integral link in the CANDU Reactor supply chain. Sartrex Power Control Systems is committed to protecting the safety of nuclear power plant workers and the general public. In order to achieve excellence in product reliability, continuous improvement in both design and manufacturing processes is vital for Sartrex’s wide selection of instrumentation and control systems. Sartrex’s quality management system is based on our ISO 9001:2008, CSA Z299.2 and TSSA recognized certifications, which keep us compliant to the best, globally recognized, quality standards. All of our systems are subjected to stringent qualification requirements which demands the very best from our teams of quality and engineering personnel. Our products are used on the front line, in time critical environments. Our number one focus is to provide our customers with reliable safety solutions that will protect the lives of people in potentially dangerous situations. Every component counts, every detail counts, every process that is completed counts towards the protection capacity of our equipment. Our team of technical personnel has on average, 25 years of hands on experience. Being in this industry and other safety related markets for over 35 years, we understand that quality and reliability are key success factors and we are continually adapting and evolving our processes to meet the stringent, but very necessary requirements, of our customers. Sartrex promises to continue to learn and apply the best possible quality management system to guarantee the reliability and dependability of our products. Sartrex Power Control Systems is in the business of designing, manufacturing, and implementing complete safety solutions for a wide range of clients. From nuclear power stations to dockside radiation monitoring for the Canadian Defense Department, Sartrex looks forward to new opportunities to improve the safety and security of citizens in all countries. The Enhanced CANDU Safety Shutdown System described below is just one example of Sartrex providing electronics expertise to secure the safety of plant workers and citizens around nuclear power plants around the world. Sartrex’s instrumentation and control systems are installed in Canada, Romania, Argentina, China, and South Korea. The EC6 reactor’s two passive, fast acting, fully capable, diverse shutdown systems are physically and functionally independent of each other. 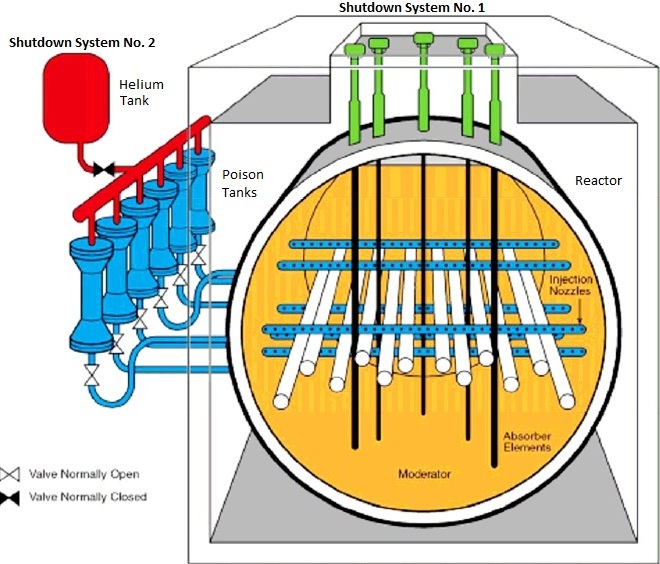 Shutdown System 1 consists of mechanical spring-assisted shutoff rods that drop by gravity into the reactor core when a trip signal de-energizes the clutches that hold the shutoff rods out of the reactor core. The design of the shutoff rods is based on the proven CANDU 6 design. The plant control centre makes extensive use of integrated digital technology to enhance the monitoring and supervisory control of functions, systems and equipment necessary for power production, and the monitoring of functions, systems and equipment important to safety. The main control room features a main operator console, with large video display units (VDUs) for plant overview and annunciation located to the front, and an array of panels, grouped by major system, located to the sides. The operator is normally situated at the main operator console where VDUs provide access to integrated plant information and controls for normal use. From here the operator also has access to historical data storage and retrieval facilities to support post event analysis and the monitoring of longer term trends. The Advanced Digital Control Center represents a giant leap forward in the control of power generation facilities. Sartrex, in partnership with AECL, designed this complex system and manufactured the control center for Qinshan III, China. Sartrex continues to be the premier supplier of the Advanced Digital Control Center for new and refurbished Enhanced CANDU 6 reactors.